User mobility is a challenging issue in macro and femto cellular networks for the fifth-generation and newer mobile communications due to the time-varying interference and topology experienced. In this paper, we consider an OFDMA-based two-tier network with one macro cell and several femto cells, wherein each macro user and/or femto user can leave or enter its serving cell frequently, referred to as user mobility. A resource allocation problem with different rate requirements of mobile users is then formulated. Assuming well knowledge of the user locations and the channel state information, we propose a dynamic algorithm with static and dynamic parts for a better trade-of between computational complexity and system throughput. 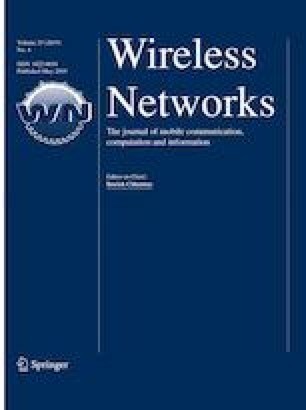 The static algorithm, named interference weighted cluster algorithm in this paper, is based on the graph theory to cluster the femtocells by minimizing the interference between clusters, while the dynamic algorithm is to deal with the user mobility by sharing the resource blocks under the constraints of rate requirements. Numerical results are demonstrated to show the effectiveness of the proposed dynamic resource allocation algorithm in terms of capacity, computational time, and outage probability. The author would like to thank Mr. Yi-Lin Tsai for his help with preliminary computer simulations. Funding was provided by the Ministry of Science and Technology, Taiwan (Grant No. MOST 104-2221-E-415-007).